The second oval track of the Formula Drift 2011 Season is Evergreen Speedway and is the only 5/8 mile short track in the Northwest. Sanctioned by NASCAR for the Whelan Weekly Racing Series, Evergreen Speedway not only hosts local oval racing, but a variety of events from drifting to drags, to 3/8 mile to figure eights, the track hosts 150 events a year! The track was revamped this this year to update its facilities and repaint the walls for a better time by all attendees – future plans include a new score board with a large screen viewer and other bigger and better upgrades. 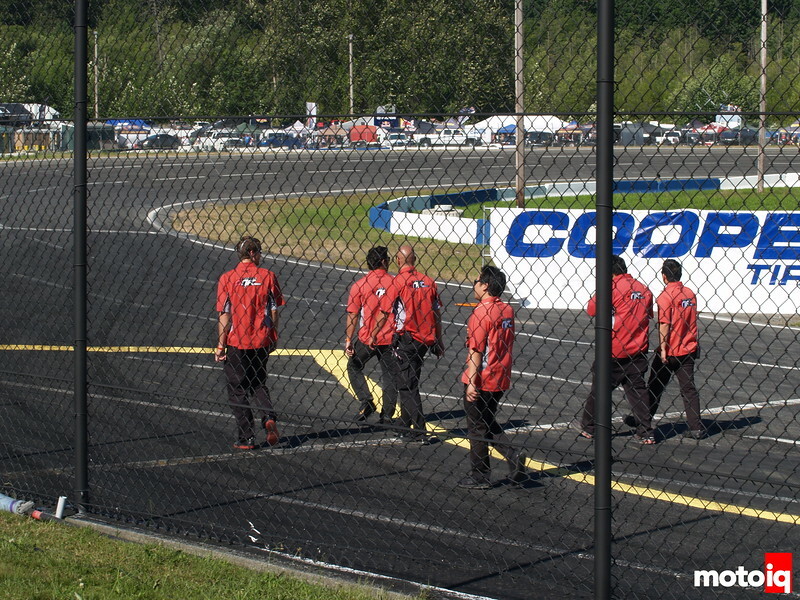 Formula Drift Officials inspecting the track, the improvements can be seen just by looking at the freshly painted walls. 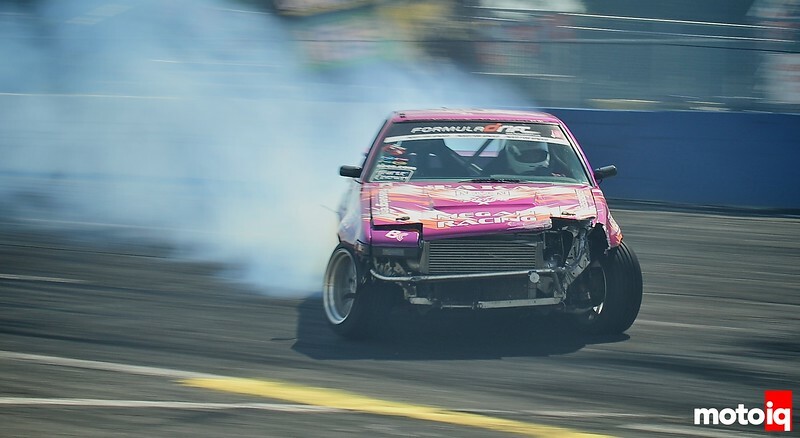 One of those 150 events is Round 5 of the Formula Drift 2011 Season where there was a Mid-Season Tech Day. There was a thorough inspection of the cars for rules compliance, including the modified Tire Rules. Most competitors had only small violations ranging from decal placement to adding weight. The only major violation announced was for the Red Bull/Mobil One Chevy Camaro of Ryan Tuerck. It really wasn’t found at Evergreen, but at Road Atlanta, and was for a modified rear control arm so the correction was made. However, all qualifying points were revoked because of the violation up to the New Jersey Round. If there were any other major violations, FD and the guilty teams won’t say. Friday Practice saw some carnage, despite the wonderful weather, as both of the Nexen Tire/Megan Racing Toyota Corollas of Taka Aono and John Russakoff were taken out and were unable to repair the cars in time for Qualifying. 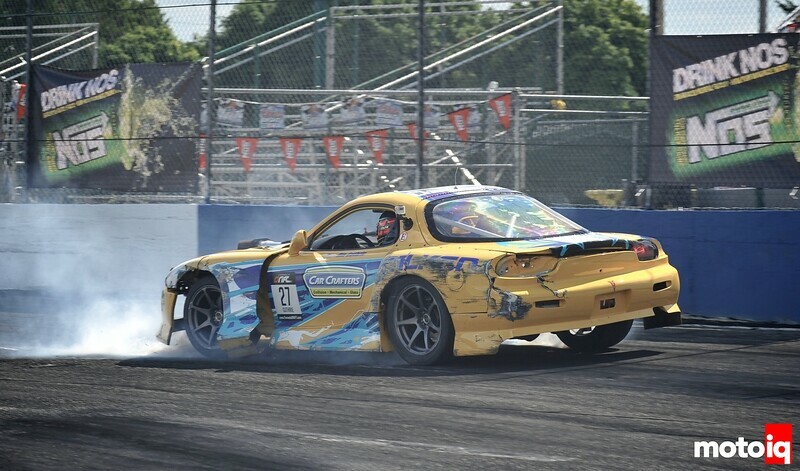 Joon Maeng kept up with his quest to gather wall damage this year as the Nitto Tire Mazda RX-8 hit the wall on the transition taking out the right corner of his splitter. Jim Guthrie in the Car Crafters Mazda RX-7 also crashed, failing to make the Top 32. Jim Guthrie also crashed prior to Top 32. 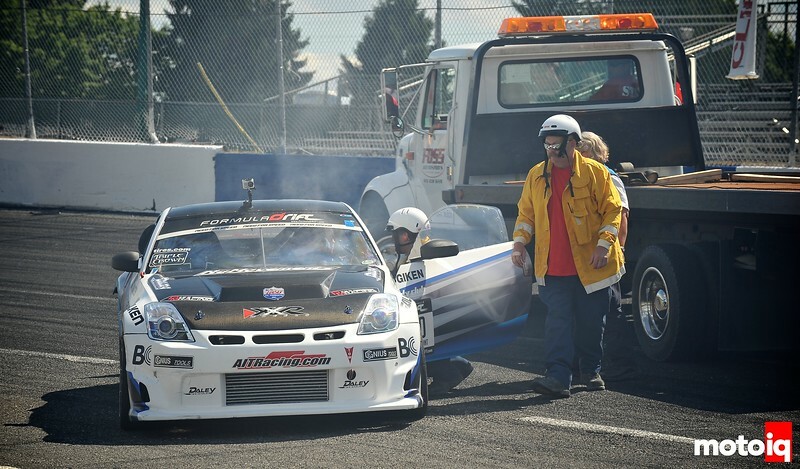 The Damage was too much and Pat Mordaunt was out, unable to qualify for Evergreen.